According to Census Report on SMEs 2011, there was a total of 645,136 SMEs operating their businesses in Malaysia, representing 97.3% of total business establishments. How many SMEs are there in Malaysia? 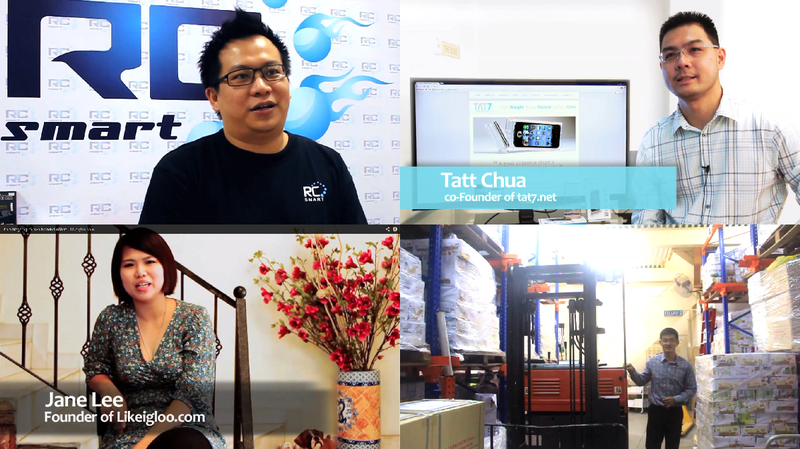 A more recent report quoting Wayne Lim, Group CEO of Malaysia SME, that the total number of SMEs in Malaysia is estimated to grow to 1 million in 2012, accounting for up to 99.2% of total business establishments. If we refer to number of registered companies and business published by SSM (Companies Commission of Malaysia), there were slightly more than 1 million companies and close to 5 million businesses (Sole Proprietorship & Partnership) registered by the end of 2012. You can imagine that most of the 1 million companies are small or medium enterprises while majority of 5 million businesses are micro enterprises. We are not sure how many of those are dormant though. Next, what is the definition of SME in Malaysia? Starting from 1 January 2014, new SME definition in Malaysia will require higher sales turnover to be classified as small or medium enterprises, as compared to the existing definition. For example, if you are in services sector, you need to have only RM1 million annual sales turnover to qualify as medium enterprise according to the SME definition up to 31 December 2013. However with new SME definition in place, RM3 million annual sales turnover is required to be classified as medium enterprise. Since our focus here is e-commerce or retail, what kind of enterprise falls under Services sector? Read also: How this SME use 3.5% rebate to make million ringgit sales via bank transfer? By referring to SME Corporation Malaysia, Service sector consists of sub-sectors such as telecommunications, private education, healthcare, finance, insurance, professional & business services, wholesale & retail trade, restaurants & accommodation. If you refer to the table below, 90.1% of the SMEs are classified in Services sector. Our next question is, how many of the 580,985 SMEs in Services sector are wholesalers and retailers? While SME Annual Report 2012/13 does not provide such breakdown, we can refer to SME Cencus 2011 which shows that close to 50% of the Service sectors are classified as "Wholesale and Retail Trade & Repair of Motor Vehicles and Motorcycles". On another hand, survey conducted by ACCCIM (The Associated Chinese Chambers of Commerce & Industry of Malaysia) indicated that 25% of the total SMEs falls under "Wholesale & Trading". As expected, most of the SME establishments are based in Selangor (19.5%) and Kuala Lumpur (13.1%), followed by Johor (10.7%), Perak (9.3%) and Sarawak (6.8%). How about GDP contribution by SMEs? The share of SME GDP to overall GDP was 32.7% in 2012 and the government wants to raise it to 41% by year 2020. SME businesses form a very large part of Malaysia's economy. But their contribution to GDP is still slightly lacking compared with (their counterparts) in developed countries. That is one of the reasons why SME development programs have been introduced to grow local SMEs, with the focus on areas like Innovation & Technology Adoption, Human Capital Development, Access to Financing, Market Access, and Infrastructure. The most notable program on ICT is non other than Get Malaysian Business Online (GMBO) grant worth RM1,000 for SMEs. However, Malaysian Communications and Multimedia Commission (MCMC) only expects to reach 14,000 approved applications by the end of 2013, 36,000 short of the grant's target. You can read more on SME Development Programs in 2013. Note: All charts above are derived from SME Annual Report 2012/13. According to a recent SME survey, 70% of SMEs in Malaysia still do not have a website. ACCCIM's survey also shows that SMEs here are still bond of using conventional method of doing business here, with only 28% of the 965 survey respondents stated that they are involved in e-commerce. While 24% of them are "in planning", the rest of 48% are not involved in e-commerce yet. 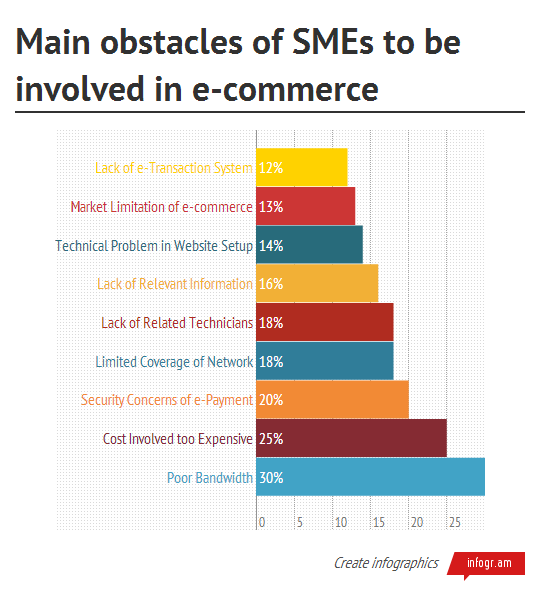 ACCCIM reveals that the main obstacles faced by local SMEs on e-commerce adoption is poor Internet bandwidth (30%), followed by expensive cost involved (25%) and concerns on e-payment security (20%). From the survey concluded above, it seems that improvements need to be executed and supported by the government, online marketplace players, and service providers (infrastructure, web store, payment, fulfillment). It will be great if SME Development Programs are designed after getting feedback from the SMEs (like survey above), so that SME's needs are really being understood. By then, more SMEs in Malaysia will be ready for Internet and e-commerce.